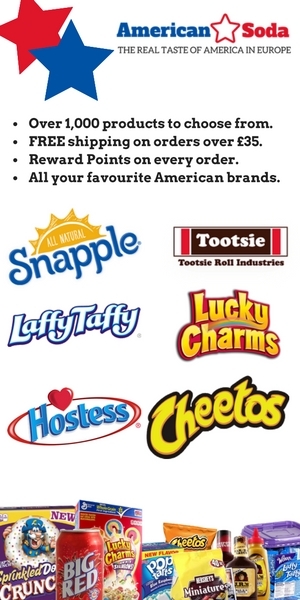 We supply a wide range of American food and drink to the UK, importing from the States top brands like Twinkies, Tootsie Roll, Pepsi, Coca Cola Big Red, Dad's Root Beer and more. Over 1,200 products are available, making us the largest supplier of US food and drink in the UK. American Soda supplies genuine American food and drink, imported directly from the US, to the UK and our huge range of over 1,200 products available in stock ready to be delivered, making us the largest retailer to provide American food and drink in the UK to-date. 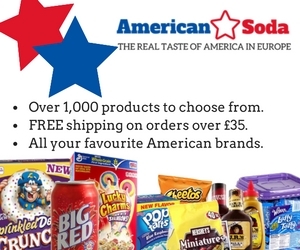 Visit American Soda today from this page, and start shopping for all of your favourite American food and drink brands delivered right to your door. Get FREE shipping on all orders over £35.00 Enjoy the taste of America in Europe.